I suppose it was bound to happen eventually. After months spent avoiding sneezing coworkers and internally repeating my wintertime stay-healthy mantra (you will not get sick, it’s all mental, you will not get sick, it’s all mental…), I have come down with a cold. Quite a nasty one, in fact. Currently, my nose is running to California, my cough is as dry as the Sahara, and my head feels as though it has detached itself from the rest of me and is just kind of buzzing around near my neck. Attractive, no? Ahem…no. But you know what they say: feed a cold, starve… something. Whatever, it’s not important. What’s important is the turkey corn chili. Don’t get me wrong, I’ve been on my fair share of weight watching regimens, but I’ve sort of just thrown up my hands with the whole thing. I mean, I like food. A lot. There’s chewy pasta, buttery steak, fresh, juicy oranges, creamy, nutty cheese, crunchy, crumbly bread, and oh! Chocolate. There’s always chocolate. And I figure I should be allowed to eat all of these things, so long as I don’t over-eat them. Sounds fair, right? Apparently it’s some foreign concept called “moderation.” Who knew? At any rate, talking with Em about lean protein and veggies made me think of turkey corn chili, and I knew I had to make some immediately. So last night I put down the Kleenex and threw together a big pot of the stuff, and let me tell you, proverbial saying or no proverbial saying, my cold is grateful. My sniffles were tamed as I curled up on the couch with my hot bowl of chili, the tomato-y broth warming my insides and the fiery blend of chili powder, jalapeño and scallion helping me successfully breathe through my nose. Sighing contentedly, I thought about how silly it is, having a cold. The sneezing, the sniffling, the coughing. It really is all mental, you know. 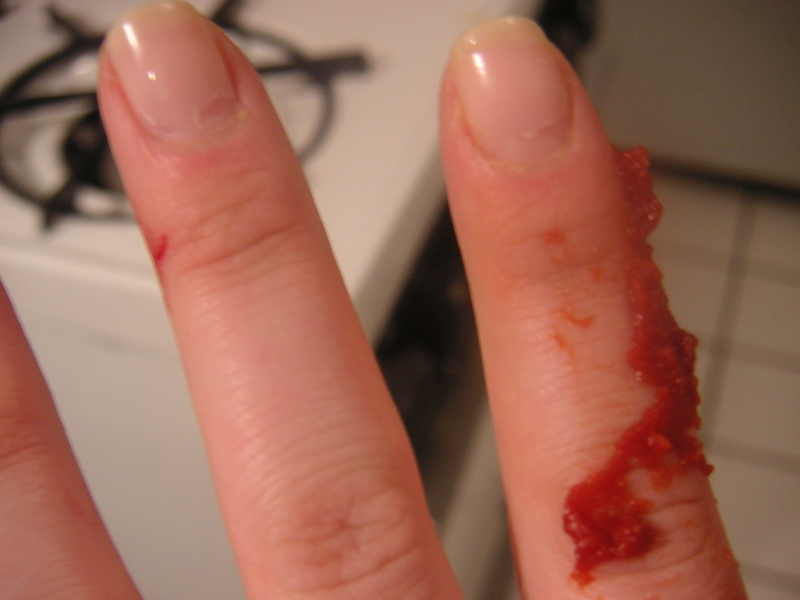 Here’s where, in my sniffly haze, I went ahead and cut myself on a sharply opened can of kidney beans. Brutal, huh? …What’s that? Oh, no. That’s tomato paste. See that little cut on my middle finger? That’s the painful flesh wound. I really love making chili because it’s substantial and delicious and it only requires one pot. Which means fewer dirty dishes, which means more time to eat peanut m&ms and watch LOST. 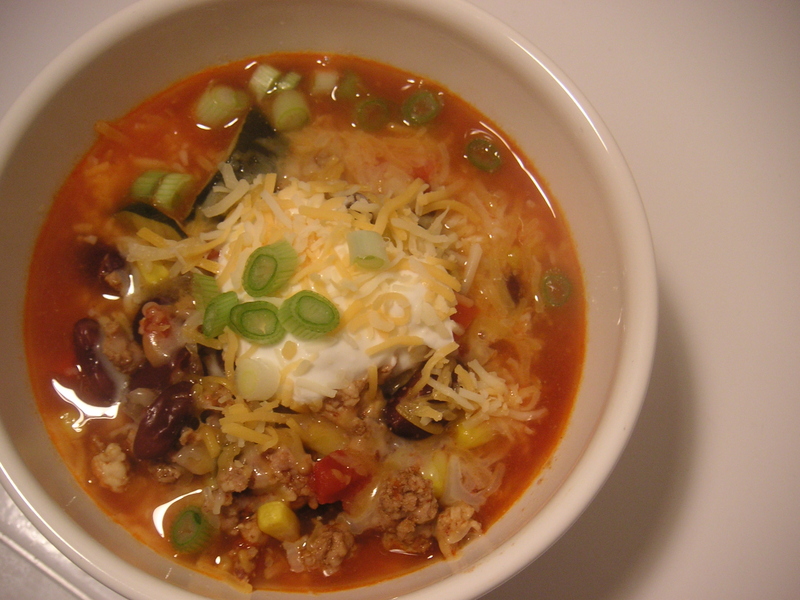 Made with ground turkey, this chili is light and healthy, yet hearty and satisfying. I normally don’t use zucchini, but I had one in the fridge and wanted to get rid of it, so I threw it in. I think I’ll use zucchini from now on. Combined with the sweet corn, it really gives this dish a light, fresh, spring-is-just-around-the-corner zest. Plus it’s a pretty color. You could substitute ground beef for the turkey, or use pinto or garbanzo beans instead of the kidney beans, if you prefer. Just be sure to watch LOST, because that show is good. Serve with a healthy scoop of sour cream (or plain Greek yogurt, if you’re South Beaching – in which case, skip the corn, too), a sprinkling of shredded cheese, and a handful of sliced scallions. I was very happy to eat this solo, but it would also be delicious over steamed rice or creamy polenta. sounds like a great recipe! and hey, thanks for bringing up “chewy pasta…juicy oranges…crunchy crumbly bread..” while i’m dieting.